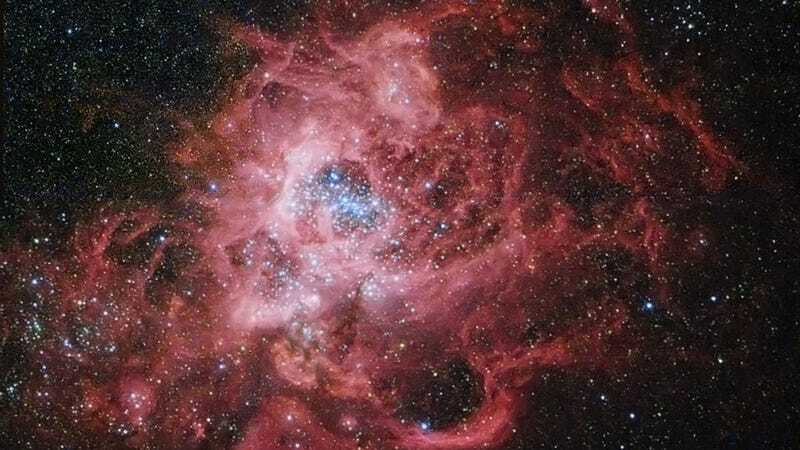 This is NGC 604, a colossal star-forming region located millions of light-years away in the neighboring galaxy M33. It's a rollicking, roiling cauldron of star creation and (occasionally) destruction, and it's only going to get more impressive as eons pass. About 3 million years ago in the nearby galaxy M33, a large cloud of gas spawned dense internal knots which gravitationally collapsed to form stars. NGC 604 was so large, however, it could form enough stars to make a globular cluster. Many young stars from this cloud are visible in the above image from the Hubble Space Telescope, along with what is left of the initial gas cloud. Some stars were so massive they have already evolved and exploded in a supernova. The brightest stars that are left emit light so energetic that they create one of the largest clouds of ionized hydrogen gas known, comparable to the Tarantula Nebula in our Milky Way's close neighbor, the Large Magellanic Cloud. Via NASA APOD. Image Credit: Hubble Legacy Archive, ESA, NASA; Processing - Donald Waid.